We've been having a heat-wave almost all week. Over 90 every day can get a little annoying... at least my pepper plants are loving it. I love hot peppers. Sometimes I think I don't know how to eat food without them. It all started with Tabasco and jalapenos, but it has progressed since then. The two chilies pictured above are bird chilies and volcano cayenne chilies. They are both wonderful for cooking and drying. Those little balls of bird chili fire kept me going all last winter. They are so small you don't need to grind them up or chop them or anything. Last year I only got one Bhut Jolokia pepper. They are a Capsicum Chinense type of pepper, so they take longer to mature. It was sad, but I over-wintered the plant, so hopefully I'll get more this year. There are flowers on the plant now, but no peppers yet. I have my fingers crossed. If you don't know what a Jolokia is (also known as a ghost pepper) it is one of the hottest peppers on earth. It was very tasty in pasta - it has kind of a smokey flavor. 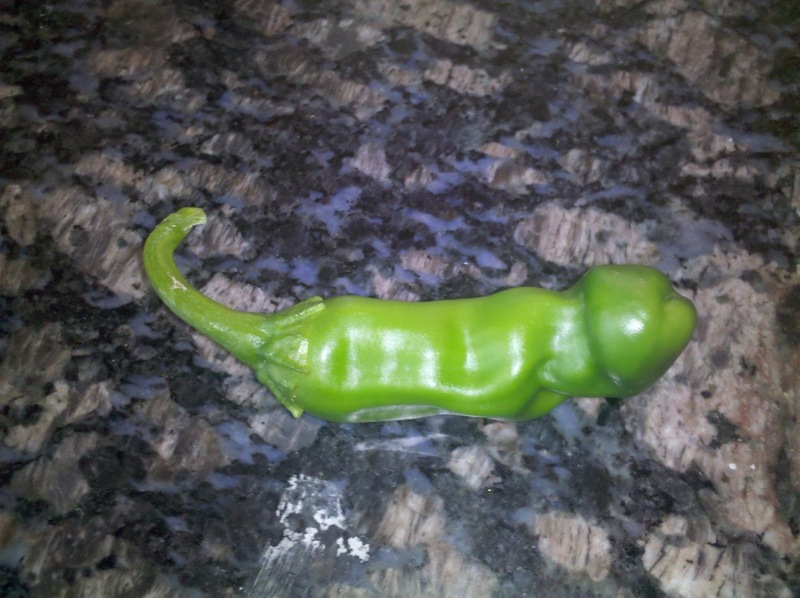 My favorite pepper is the Peter Pepper. It has the perfect amount of heat for me - and it's a little dirty in appearance. Heehee. I love Fataliis, too, but I have never gotten any seeds that were viable. If you have some, could you send them to me? I got lots of seed to trade. Growing peppers is super easy. Just get a pot and stick it in a very sunny spot. Water it when it gets a little wilty and maybe give it some plant food every once in a while: High nitrogen for foliage growth and low nitrogen for fruit production. The plants can attract aphids. I just squish them with my fingers because I don't have many plants and I like to baby them. Once the ladybugs come for the summer I don't have to do anything. So if you have a bunch of plants that are having a problem with aphids you should probably get some of those ladybug larva they sell online.